Longbow, originally developed by McDonnell Douglas for corporate use, was named for the Apache Longbow helicopt er. It was later sold to Daedalus Development and is now professionally managed by OB Sports, but the aeronautical theme still flies as do the small aircraft above, in and out of Falcon Field. The sky buzzes like an international hub of small planes, including the Red Baron, with an acoustical lull. Winged art, fabric sculptures imitate hang gliders throughout the course, posing as if they might transport you to the distant and striking Red Mountain. Feathered friends also fancy it their own aviary so golfers witness the bird book of species, taking flight in any round. Panoramic views of the Usery, McDowell and Superstition Mountains reflect the essence of desert golf, changing with every degree of the sun’s rotation and clouds’ flotation. Annually ranked as one of the top courses to play in Arizona, the award winning design of Ken Kavanaugh, embarks you on a journey into imagination of the natural environment. Classic challenges and subtle complexities are evident throughout the desert style layout as it weaves through Saguaros, cacti, Yucca and Ocotillos. Hole #4, Par 4, 429 yards – The number one handicap requires accuracy, accuracy and more accuracy. A long lake on the left side of fairway to green is hidden from the tee box. Too long a drive may reach the bunker in the elbow of the fairway, too left is out of bounds. Consider the approach shot carefully, as the green quickly slopes off to the waterside on the left and behind. Too far to the left or too long is too bad for you. Hole # 8, Par 4, 338 yards – Should I, could I, or better not? This short par 4, entices golfers with the prize of reaching the green from the tee for an eagle, but most should play it safe with a mid -iron to fairway wood and take chances instead with the approach shot for an elusive birdie. The green is heavily swathed by bunkers front and left. Surface subtleties protect the promise land with false sides that feed into the desert. If you go for it, realize that accuracy is at a premium with risk greater than reward. However, the thought of putting for an eagle on a par 4 may be too hard to resist. Put up or shut up, and good luck!! Hole #16, Par 3, 224 yards – Here the designer seemingly envisioned a deceptive reception to the golfer’s decision on club selection. From the tee box, the green is hidden behind deep bunkers front and right. Short hitters aim left while long hitters find safety on the right side approach as that bunker’s top bank feeds into an invisible landing area. The green is large, but the width is greater than the depth, so distance is paramount. Hole# 18, Par 5, 538 yards – On this dogleg right, depending upon what tee box you are playing, the fairway slopes to problems awaiting the slightest driving error. 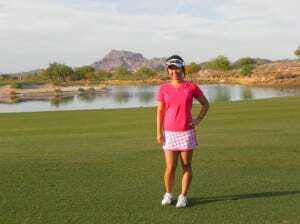 The right side is lined by mesquite trees and out of bounds all the way to the green. The left side bunkers at end of fairway beckon that errant shot. Don’t forget the desert and the divided wash that splits the fairway in two, challenging golfers of any level. Massive bunkers short right and left front, guard the huge green with mounds and slopes. What a great finishing hole! Libations for celebrations or commiserations are in order. If you haven’t taken advantage of the efficient beverage cart service, or even if you have, there is no better place to gather than fireside on the patio of the 19th hole. Food options are fresh and yummy. Jay Larscheid, the charitable and award winning manager, leads a friendly staff in quality service and maintenance. The well-stocked clubhouse is set with the latest fashions and equipment. Home to the AJGA Heather Farr Classic, this renowned golf club has provided memorable moments for some of the brightest stars on the PGA and LPGA circuit. Complete practice facilities along with expert instruction by PGA and LPGA staff members as well as home to the OB Sports Golf Academy afford all the chance to improve and compete. 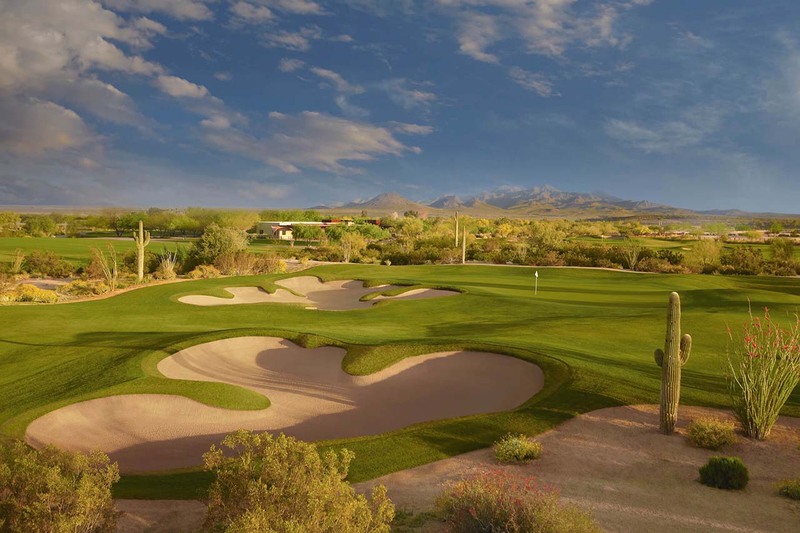 A short drive from Phoenix, a day at Longbow will leave you longing for more.